We are a Tattoo Shop in Tyler, Texas focusing on custom tattoos. We are located close to the Tyler city limits. 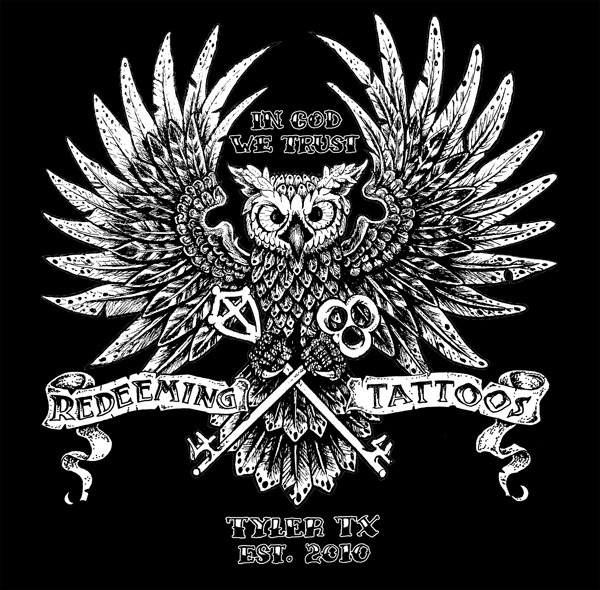 Our shop is a safe and sterile environment, fully licensed by the state of Texas to perform the art of tattooing. Redeeming Tattoos is often described as “different” or “light.” We encourage anybody with questions to contact us by stopping by our shop, to ask about pricing, or our safe practice of tattooing. If you have any tattoo related questions, please email us at floyd@redeemingtattoos.com or call 903-360-4863. Stop in and talk about your idea with Floyd for your next tattoo. Floyd has done thousands of custom designs over the past 16 years and has plenty of design experience. We require a non-refundable $50.00 deposit on the day you set up an appointment for a custom tattoo. It will be deducted from the final price of your tattoo.